I am a lover of titles and often times am drawn to a book due to a provocative title, and “Let The Great World Spin” is a case in point. Walking through Barnes and Noble I’s seen this book on the end cap and immediately was drawn to the title – I found it immediately haunting and thought provoking. Once I began reading the content was the same. 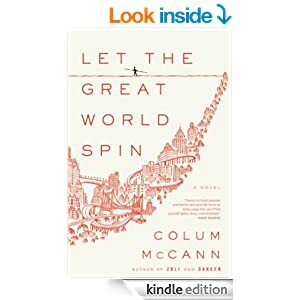 This gem by Colum McCann easily made it to my personal Top 10 novel list. “In the dawning light of a late-summer morning, the people of lower Manhattan stand hushed, staring up in disbelief at the Twin Towers. It is August 1974, and a mysterious tightrope walker is running, dancing, leaping between the towers, suspended a quarter mile above the ground. In the streets below, a slew of ordinary lives become extraordinary in bestselling novelist Colum McCann’s stunningly intricate portrait of a city and its people.